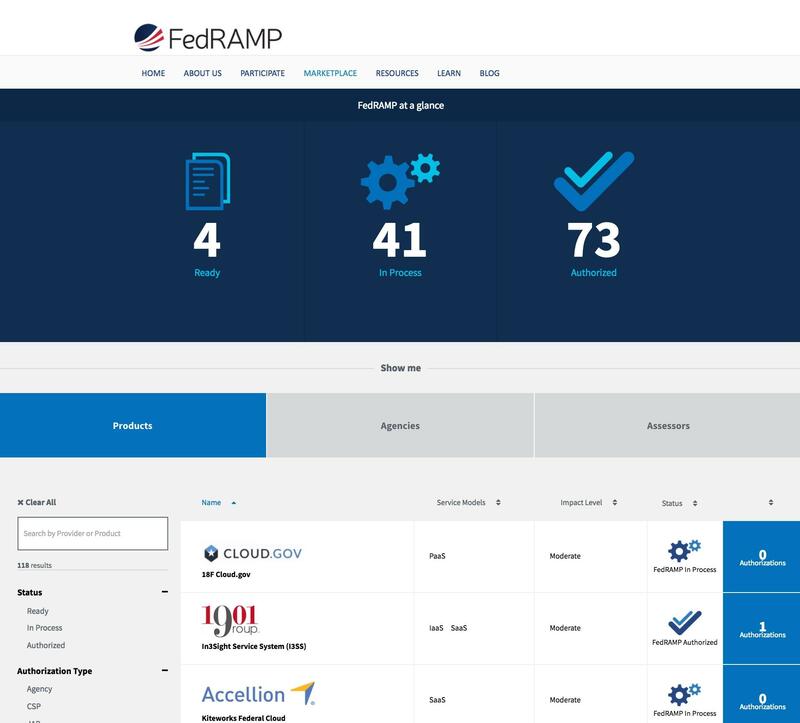 We’re incredibly excited to announce the launch of the new FedRAMP Marketplace dashboard! It’s loaded with all sorts of ways for you to see how everyone is participating with FedRAMP! When we launched the FedRAMP Marketplace about 3 years ago, our intent was to create a place for agencies and CSPs to connect. As FedRAMP has grown, so has our marketplace. It’s become a space where all of you interact - CSPs, agencies, and 3PAOs - and in more than just a one way interaction. The more deeply and varied you have begun to interact, the more information and functionality you’ve expressed you’d like to see. We’ve responded by continuing to grow and segment the marketplace by introducing categories such as FedRAMP Ready and In-Process for our CSPs, identifying which agencies have authorized CSPs for use, and even which 3PAO assessed authorized CSPs. As we continued to introduce these new categories within the marketplace, our website didn’t always provide a graceful way for people to interact. We want to make sure we provide the best experience possible whenever you go to www.FedRAMP.gov, so we decided it was time to upgrade our marketplace! We partnered with 18F and used the agile BPA to create a user-friendly dashboard. Through an enjoyable procurement process (no seriously, it was actually fun at times! ), we chose True Tandem LLC as the vendor to help us build the dashboard. We gave them a quick turnaround timeframe of only 60 days, and not only did they build an awesome dashboard, but they built it in just 55 days! We gave TrueTandem and 18F a goal of building a “ridiculously easy” user interface and intuitive design. They went to work immediately to harness the strength of agile methodology and user-centric design to meet our requirements. Through weekly sprints and constant user-testing, we iterated over the course of about 8 weeks to be able to bring you the new marketplace. We heard you want to find what you want as fast as you can find it. Sometimes, that’s easiest by simply typing a query into a search box. You can do that now. We know that information is easier to see when you can see it how you want to see it. You want to sort the information how you want , by vendor name, by agency, by number of ATOs , and however else you can slice and dice the data. You can do that now. Sometimes you want to compare things. How many ATO’s does one provider have compared to another? How many CSPs are authorized by USDA versus how many are authorized by HHS? You can do that now. You want more information about CSPs and 3PAOs. You want to know more about their services and what they offer. You can do that now now. You’re an agency trying to implement a service currently undergoing an authorization at another agency and you want to know when that provider is predicted to have an authorization. You can do that now. You want to download the marketplace data in an easy format and use it for a report or use it offline. You can do that now. We’re thrilled to see all the ways you’ll be interacting in the new marketplace! Let us know your thoughts in the comments below or feel free to reach out to us via info@gsa.gov!